A considerable portion of Rajasthan lies in the desert region yet this has not deterred wildlife from flourishing there. From the majestic Tigers to the elegant peacocks and extremely endangered Black Bucks - animals birds and reptiles are found there in plenty. 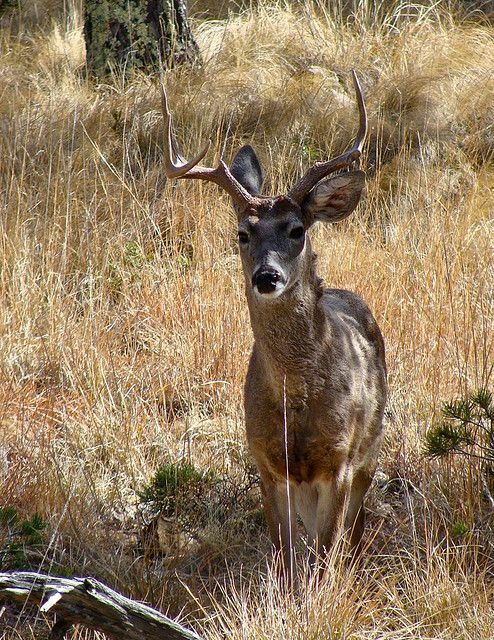 There are quiet a numebr of wildlife species typical to the desert region found in some of parks as well. Rajasthan is an abode of many wildlife sanctuaries and National Park, however none of them is similar to the Desert National Park. The park is widely different from a usual park and actually for a novice, the park has little importance. Nonetheless, the Desert National Park has an important role to play in maintaining the ecological balance of the region. It is the largest park in the state of Rajasthan spreading over an area of 3162 sq km. Around one fifth of the park is covered with sand dunes. The rest of the landmass comprises craggy rocks, compact salt lakes bottoms, inter medial areas and fixed dunes. Flora - The vegetation is sparse with only few grasses and shrubs that provide food for the wildlife inhabitants of the park. Ensconced comfortably in the Aravalli and the Vindhya ranges, the Ranthambore National Park spreads over an area of 400 sq km. Earlier, the area was under the Maharaja of Jaipur and served as a hunting ground for him which ensured that the animals were not hunted down regularly by the common people. The area was established as a Wildlife Sanctuary in the year 1955 and it gained the status of a National Park in 1981. In between in 1973, when the 'Project Tiger' was initiated to conserve the depleting number of the tigers in the country, Ranthambore National Park was designated as a tiger Reserve as well. As a Tiger Reserve, the park has been successful in controlling the loss of tiger life in its area thereby making it a major attraction for tourists coming into park. The topography of the park mostly consists of undulating hills intermixed with water bodies and meadows. There are three major water bodies in the park - Padam Talao, Rajbagh Talao and Malik Talao. The terrain of the park also includes steep cliffs, deep gorges, valleys and flat land. Flora - The vegetation of the park is mostly dry deciduous type with dhok forming the majority of the trees. Apart from this there are around 300 species of trees and plants found in the park including Aam, Imli, Babul, Banyan, Ber, Dhak (or Chila), Jamun, Kadam, Khajur, Khair, Karel, Khejda, Kakera, Mohua and Neem. 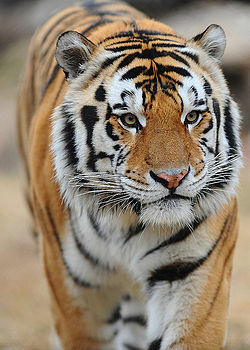 Animals - Undoubtedly, the Tiger is the major attraction of the Ranthambore National Park. 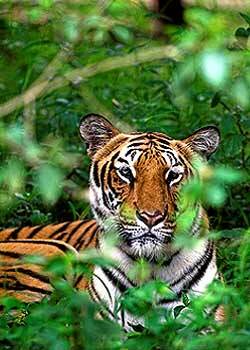 However, sighting a tiger is only possible through plenitude of patience and luck. In such circumstance, other animals of the park keep the visitors engaged and entertained. Prominent among these are Leopards, Striped Hyenas, Indian Wild Boar, Chinkara, Jackals, Indian Flying Foxes, Indian Foxes, Sloth bears, Sambar deer, Chital, Nilgai, Macaques, Small Indian Civets and Common mongoose. Reptiles - The reptile population of the park include Snub Nosed Marsh Crocodiles, Desert Monitor Lizards, Tortoise, Banded Kraits, Cobras, Common Kraits, Ganga Soft Shelled Turtles, Indian Pythons, North Indian Flap Shelled Turtles, Rat Snakes, Russel's Vipers, Saw-scaled Vipers and the Indian Chamaeleon. Birds - Due to its water bodies, Ranthambore National Park attracts a whole variety of birds, both resident and migrant. There are around 300 species of birds in the park including Parakeet, Myna, Barheaded Goose, Owl, Woodpecker, Kingfisher, Eagle, Partridge, Pigeon, Flycatcher, Hornbill, Cuckoo, Heron, Sparrow, Vulture and Falcon. The Sariska Wildlife Sanctuary, as similar to the other wildlife sanctuaries of Rajasthan, was previously a hunting reserve of a Maharaja, in this case, the Maharaja of Alwar. The area was declared a Wildlife Sanctuary in the year 1958 and a National Park in 1979. The 800 sq km of the park has around 480 sq km as its core area. The terrain of Sariska includes hilly areas and narrow valleys of the Aravalli. Within the boudaries of the park, there is a fort, palace and few temples. Its closeness to two of the most attractive tourists destinations in India, Agra and Delhi, has ensured a continuous flow of visitors to the Sariska National Park. This is in a way both positive and negative for the park since it gets exposed to a wide range of people, yet many of them visit it mainly due to its location. To gain entry into the park, a permit is required which is obtained at the entrance itself. Extra charges are imposed on private vehicles and carrying cameras. Flora - The vegetation of the Sariska National Park consists of grassland, dry deciduous forests and scrub-thorn arid forests. Dhok, Khair, Tendu, Ber, Surwal and Goria form the principal vegetation of the park. The park appears dry in the summer months, however during winters, it is extremely dense with green trees and plants. Reptiles - A good number of Gharials can also be sighted near the Silsereh Lake in the park. Birds - The bird species of the park include Peafowl, Red Jungle Fowl, Spur Fowls, White Breasted Kingfishers, Golden Backed Woodpeckers, Great Indian Horned Owls, Quails, Partridges, Sangrouse, Tree Pies, Crested Serpent Eagles, Parakeets, Drongos, Sunbirds and Vulture. However, the prime attraction, nevertheless remains the national bird of the country, Peacock. With the advent of monsoon, the peacocks spread their feathred tail and perform a beautiful dance that nearly has the visitors clapping with delight. 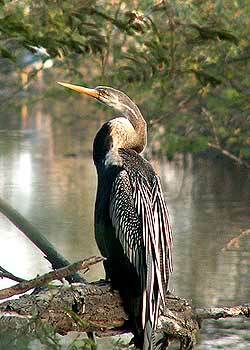 Officially known as the Keoladeo Ghana National Park, the Bharatpur Bird Sanctuary occupies an area of 29 sq km. The park was initially created by the Maharaja of Bharatpur in the 19th century as he desired to save his town from the calamitous flood water. The dam he built left back a depression which was later converted into Bharatpur Lake. The lake served as a hunting preserve for the Maharaja for quiet sometime before it was finally declared a National Park in the year 1982. It gained the status of the World Heritage Site in the year 1985. The name Keoladeo Ghana National Park draws its name from an ancient Hindu temple dedicated to Lord Shiva which is located in the park area itself, Keoladeo. The term Ghana indicates the thickness of the forest which earlier used to occupy the region. Visitors require to get an entry permit from the warden at the entrance of the park. Separate payments have to be made for carrying cameras and other photographic equipments. Flora - The 29 sq km of the park is majorly covered with kadam forests, grasslands and shallow lakes. Animals - Though the birds at the Bharatpur National Park hog much of the limelight, yet the animals to have their fair share of spectators and lovers. The most prominent animals that can be seen in the park are Golden Jackal, Striped Hyena, Fishing Cat, Jungle Cat, Nilgai, Sambar, Blackbuck and Wild Boar. Reptiles - A wide variety of reptiles can also be found in the Bharatpur National Park. Visitors can get to see the large Python lazing in the warmth of the sun rays.